Going zero waste isn’t rocket science. It’s also not about producing ZERO waste. You can read more about this tricky term in my post What is Zero Waste? What is the Circular Economy? Zero waste is an industrial term. You can still get your business certified zero waste / closed loop / circular economy (they all mean the same thing!) and what it means is a 90% diversion from landfill. The fact of the matter is that it’s impossible to go completely zero waste because we don’t live in a circular economy but rather a linear one. I’m not going to bore you with all the facts, but if you’re intrigued be sure to check the blog post out above! No, no rather you’re here to learn how you can cut 80% of your waste just by doing three simple things! And, we’ll get there in one mome. Because, first I’d like to introduce you to our sponsor! This post was sponsored by Arbor Teas. All thoughts and opinions are my own for more information please see my disclosure policy. Only tea brand to offer loose leaf tea in backyard compostable packaging! They source their teas from organic, biodynamic, and regenerative farms. They have plastic free matcha. I repeat PLASTIC FREE MATCHA. They are just genuinely the nicest people on the face of the planet. And, their teas are just freaking amazing! As I write this blog post, the sun is shining, the birds are chirping, my apple tree is in bloom, I’m drinking their Organic English Breakfast Tea with a few drops of CBD oil and it feels like a perfect morning. They’re typically always doing pretty well probably because they know I’m coming. But, if that’s what it takes to get perfectly sorted bins - then SO BE IT. But, while performing these waste audits I’ve seen several recurring themes. While I tend to view zero waste as more of a choose your own adventure because everyone creates different types of trash there are some universal heavy hitters. Did you see this one coming? 60% of the average American family’s trash is full of organic matter. This is one of those disconnect areas. 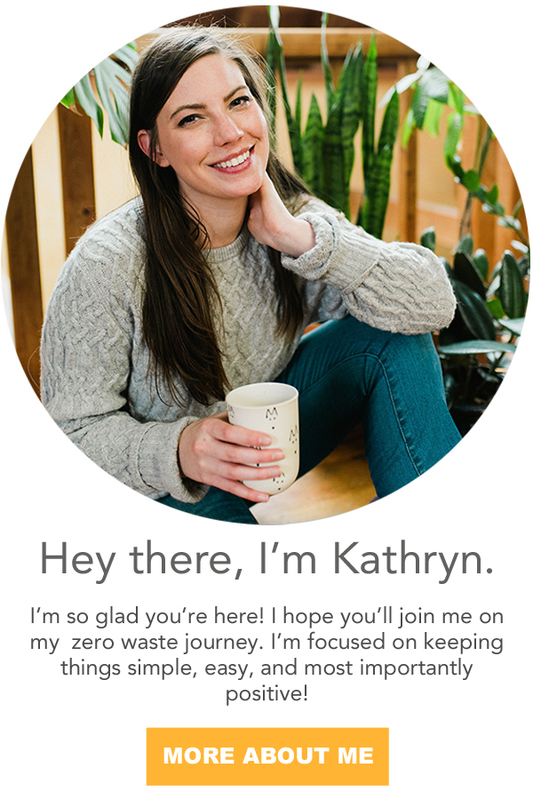 I think most people know that they SHOULD compost, but they don’t because they don’t have the time or energy to learn more about composting in their area. I’m going to make it so simple for you! 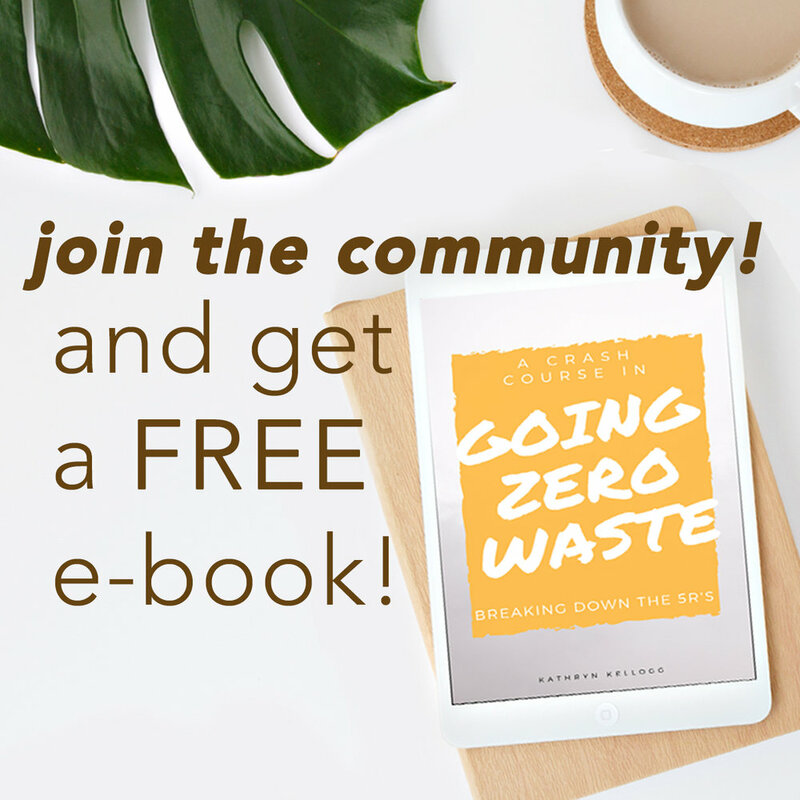 If you can just block out 30 minutes in your schedule, sit down and read both of these blog posts, you will be able to find a composting solution for you - I just know it! Composting is not as scary as it sounds and it is so important. Organic material (food scraps, newsprint, hair, nail clippings, organic cotton tampons etc) can’t breakdown in landfills because they’re not aerated properly. 16% of all methane emissions in the US come from landfills and methane is around 30% more powerful than CO2. When we talk about climate change this has to do with gasses that warm our atmosphere. The most common one we hear about is carbon (CO2) but the fact is there are a lot of other more powerful gasses that can stay in our atmosphere much longer even for thousands of years like hydrofluorocarbons. You can read more about this in the blog post on Where to Buy Carbon Offsets. I try not to harp on food packaging because I know this is a really hard one for a lot of people. In fact, a lot of people don’t want to go zero waste because they don’t have bulk stores available which I think is really sad because remember… it’s not about being perfect it’s just about doing the best you can! Of course, if you have bulk bins and package free food near you, definitely try and opt for that! You can read more in my blog post The Ultimate Guide to Zero Waste Grocery Shopping. However, since most of us go grocery shopping once a week, it would stand to reason that one of the biggest sources of trash that we would produce would come from food and food related packaging. I’m not going to tell you just to shop package free, I’m going to recommend that you switch to a whole food, plant based diet. What I like about this recommendation is that it’s not going to deprive you of anything per-se. Maybe you just really want a pop-tart one day or you really want to celebrate a big occasion with a steak. This isn’t going to cut you off from any food groups but is going to move you to a 90% whole, fresh food, diet made up of mostly plants i.e. fruits, veggies, and grains which is inherently healthier and one that just naturally reduces the amount of packaging that you’ll acquire. Plus, eating this way also creates a drastic improvement in your carbon footprint! So, you’ve heard all of the health gurus say it time and time again - shop the perimeter of the grocery store. And, try to make a few of your own staples like homemade nut milk and peanut butter. Throw in a few hours of meal prep on the weekend and you’ve got yourself EASY plant based meals ready to serve up and eat in a matter of minutes. This week I baked 5 sweet potatoes, made a big batch of mango, banana smoothies (yes you can freeze a week’s worth of smoothies!) and made a huge batch of vegetarian chili that is just OMG. And, now I’ve got breakfast and lunch taken care of for the week with just by spending an hour in the kitchen knocking things out. If you’re still feeling lost on ditching food packaging then check out the zero waste grocery store challenge at Grocery Outlet and Target that I ran with several other friends! Idk what it is about paper towels, but this swap is an area that people just want to fight me on. It’s honestly absurd the amount of paper towels the average family goes through most of which are entirely unnecessary. So, I’ve created a handy blog post for you called 6 Tips for Breaking Up With Paper Towels, there’s also a video if you prefer video content! Well, that’s it! With tree simple and easy swaps you should be well on your way to cutting out 80% of your trash. Also a big shout out to the sponsor of this post - Arbor Teas!! Have you done a waste audit? I’d love to know the bulk of what you find in your trash can. I have witnessed some crazy wildfires in California over the last two years. The Atlas and Patrick fires both burned less than 15 miles from my home in 2017. As someone who's lost everything to fire before, it was an incredibly uneasy and tense time. Growing up my biggest fear was always fire. I think it's a common fear among children, but every night I would pack a backpack full of my favorite things and hang it on my doorknob. After doing this for several weeks, my mom asked me, "Why do you do pack a backpack before bed?" And, I responded with rock-solid toddler logic, "In case there's a fire." While there was no need to be afraid of any immediate fire, 19 years later my house did burn down. Thankfully no one was hurt, but I lost almost everything I had. The fires in California are starting to feel like regular occurrences, and it's got me thinking about being prepared for an emergency. Maybe there'll be a big earthquake? Maybe there'll be a fire? Perhaps I won’t be affected by any of these things, I don’t know, but I want to try and be prepared. Since I write a blog about being eco-friendly, I thought it'd be fun to try and round up some zero waste items for building up your emergency preparedness kit! Obviously, it will be pretty impossible to have an entirely zero waste emergency kit, but I’ve tried my best to round up some of the reusable and recyclable products I’m stocking. Bottled water is ideal in times of emergency because natural disasters can contaminate the water supply. It’s recommended that you have a gallon of water per person in your household for three days because you can’t always count on your water being potable. After seeing a lot of people evacuate their homes, I think it’s best to have a large source of water in case you’re stuck at home, but also individual bottles so you can grab and go. I’ve been looking for individual bottles to put inside of my emergency backpack and am so glad I discovered PATHWATER they donate 5% of their profits to non-profit organizations that fight to end plastic waste. One of the first things I look for when supporting companies, is that they give back. The other upside to this bottle is that it’s meant to be refilled!! It’s like a reusable/disposable water bottle hybrid which I think would be great in case of an emergency. They sell the bottles at 7-Eleven and Safeway. As far as larger sources of water at home, I’ll be buying several of the large 5 gallon bottles that can be refilled. Since I don’t have space for a bulky water cooler, I’m looking into buying a spout that will attach to the bottles. I feel fortunate where I currently live; we have a wood burning stove that’s the primary source of heat for the house. The top of the furnace has burners on it so you could cook in the home without electricity or gas. Living a zero waste lifestyle, I have a lot of dried foods like oatmeal, beans, rice, etc. so we’d be able to make food for a couple of weeks. While we don’t usually eat canned food, I definitely have a stockpile in case! I also kept my manual can opener from my PZW days! The problem is if I had to evacuate, there’s no way I could bring a lot of that food with me because it would be too heavy. I’ve opted for some higher calorie energy bars like Clif Bars that can be sent back through a TerraCycle program. In the same vein, it would be pretty easy for Nala if we were stuck at home. If we had to travel, I have grabbed a bag of freeze dried food from Open Farm (our pet food of choice) because they’re also partnered with Terracycle. I have a portable hand crank radio and flashlight which eliminates the need for batteries! Not only is this good from an environmental perspective, but it’s also practical. If your batteries die and you don’t have replacements, what are you going to do? If you can hand crank and power the device, you don’t have to worry about running out of power. I have a small first aid kit in my emergency backpack which is designed for travel. But, if you’re looking to build a more extensive eco-friendly first aid kit be sure to check out the blog post! During the fires the air quality was terrible. It was raining ash on more than one occasion, and everyone recommended N95 masks which were, OF COURSE, sold out everywhere. Getting your hands on a mask was tough. Thankfully, my boss in 2017 had gotten some for everyone in the office, and I was smart and saved them. Technically the N95 masks are disposable one-time use masks, but we kept reusing ours because it was better than nothing. I saw a few people walking around with some intense looking masks. They looked a little like Bane from Batman. After researching those masks, I found they were reusable! I bought two of those, they’re vogmasks, for our backpack, so we don’t have to worry about purchasing disposable ones anymore. While it’s great that this is environmentally friendly, I also chose this for health reasons. If we have to evacuate, having one mask we can reuse over and over means less weight in the backpack and one less thing to worry about. I think in an emergency having a pack of wet wipes is a great idea. I’ve opted for some biodegradable wipes. I don’t know much about wet wipes, so I’m not entirely sure they are the most eco choice, but I do know that no matter what - you shouldn’t flush them! I bought 500 trash bags at Costco a year before I went zero waste, and I still have SO many leftover. I use them mostly for litter cleanups. I think it’s pretty hilarious that people always call me out for having plastic trash bags when I pick up litter… but they are the most effective way of holding trash. And, I have about 457 left so I might as well use them for good! I also have a pack of pads and tampons from my PZW days that I’ve put in my emergency backpack. If I had to evacuate, I can’t foresee an instance where I’d be able to rinse and dry my Thinx. My pads and tampons are generic since it’s what I had before I went zero waste, but if you’re buying some new try and opt for organic. I also think a cup would be a pretty good option since they don't require a lot of water to clean. We have a pair of plastic ponchos, and I’m pulling together a few items of clothing for both Justin and me. Having a few pairs of undies, socks, thick leggings, and a pullover would be ideal. Wool is my preferred fabric of choice (except for the undies) because it’s a high-performance natural fiber that helps to regulate body heat. I’m scouring thrift stores for these items, but haven’t managed to buy everything I need. I’m also working to pull together an emergency binder that has a copy of our important documents like health insurance, drivers licenses, passports, marriage license, cash, etc. From what I’ve read, it’s also a great idea to put this info on a thumb drive and store it in a safety deposit box, so that’s something I need to do too. My kit isn’t perfect yet; I’m about half-way there. I’m not going to lie planning for all of this is a little overwhelming. I’m certainly not going overboard by any stretch of the imagination, but still, it’s a bit anxiety-inducing to think about. In the end, I’d rather be prepared than not prepared in case something does happen. Have you made an emergency kit? Have you considered trying to make it more eco-friendly?